Hot Dog: Affenpinscher Banana Joe Wins Best In Show : The Two-Way Five-year-old Banana Joe beat out Swagger, the old English sheepdog, and five others. More than 2,700 dogs too part in the competition. 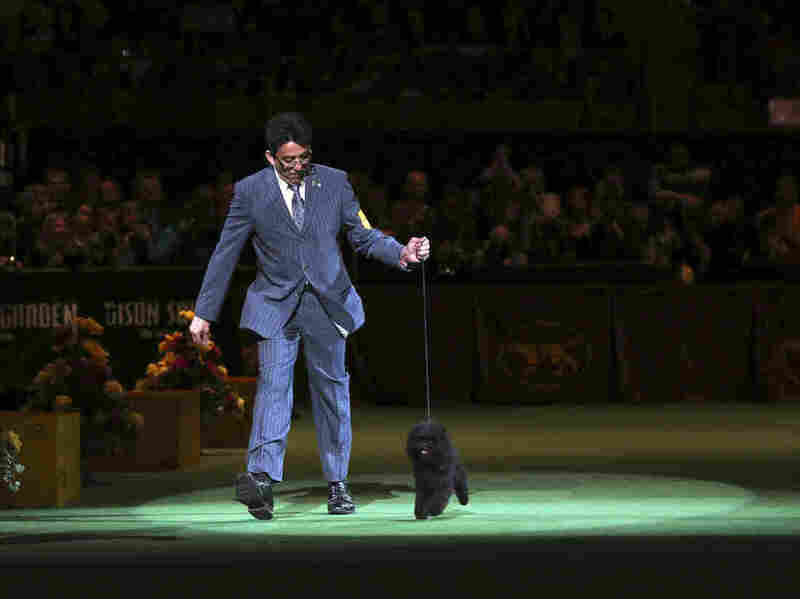 Ernesto Lara presents Banana Joe, an affenpinscher, during the Best in Show competition at the 137th Westminster Kennel Club dog show on Tuesday at Madison Square Garden in New York. He's America's top dog: An affenpinscher named Banana Joe was named best in show Tuesday at the Westminster Kennel Club in New York. "Affectionately called a monkey dog because he looks just like one, Banana Joe made up for near misses the last two years at Madison Square Garden. "The 5-year-old wagged his tail a mile a minute after earning his 86th best in show title overall. It was a timely win, too, coming a day before he was set to fly back to the Netherlands with his owner." Swagger, the old English sheepdog, was named reserve best in show. An American foxhound, a bichon frise, a German wirehaired pointer, a Portuguese water dog and smooth fox terrier rounded out the top seven. More than 2,700 dogs took part in the competition.